California straddles the juncture of two great crustal plates: the Pacific plate and the North American plate. Monterey, Santa Barbara, Los Angeles and San Diego are on the Pacific plate, which is constantly moving northwestward past the North American plate. 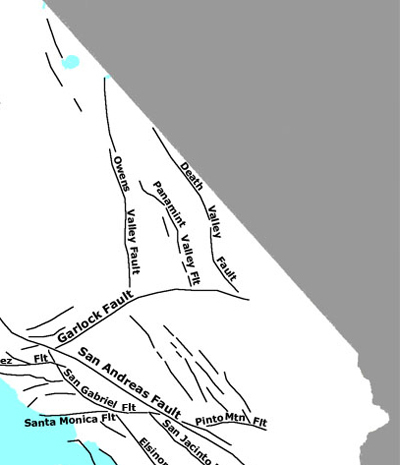 The North American plate includes the rest of California east of the San Andreas Fault. The relative rate of movement is about 2 inches (50 mm) per year. Although the San Andreas Fault is considered the boundary of the two great crustal plates, some of the motion is taken up on faults as far away as central Utah. In California, about 40 mm/ year of the slip occurs on the faults of the San Andreas system, and about 10 mm/year of slip occurs on faults in the Mojave Desert and Basin and Range area, east of the Sierra Nevada (a system known as the eastern California shear zone). The constant motion of the crustal plates causes stress in the brittle upper crust of the earth. These tectonic stresses build up as the rocks are gradually deformed. This rock deformation, or strain, is stored in the rocks as elastic strain energy. When the strength of the rock is exceeded, rupture occurs along a fault. The rocks on opposite sides of the fault slide past each other as the rocks spring back to a relaxed position. The strain energy is released partly as heat and partly as elastic waves called seismic waves. The passage of these seismic waves produces the ground shaking of an earthquake. Fractures in the earth’s crust along which the rocks on one side have shifted relative to those on the other side are called faults. The total amount of displacement along a fault may be a few inches or many miles if it has accumulated over millions of years. Faults are more likely to have future earthquakes if they have had more recent earthquakes along them, have had greater total displacement, and are aligned so that movement can relieve the accumulating tectonic stresses. There are thousands of recognized faults in California, hundreds of which have been given formal names, but only a very small number of these pose significant hazards. The motion between the Pacific and North American plates occurs primarily on the faults of the San Andreas Fault system and the eastern California shear zone. Other faults have much lower rates of movement, and correspondingly longer times between significant earthquakes. In order to classify faults by their relative hazards, geologists have found they can recognize faults that have been active since the last ice age (during the “Holocene,” about the last 11,000 years). These include the most active faults, and represent most of the earthquake hazard. Faults that have ruptured to the ground surface in Holocene time are “active” and are included in Alquist-Priolo earthquake fault zones. There are several other definitions of activity, used for other purposes, such as the siting and design of large dams, power plants and other facilities. Another commonly used designation is for faults that have offset geologic units from the Quaternary period (the last 1,800,000 years). Faults that offset Quaternary units are sometimes called “potentially active.” Determining if a fault is “active” or “potentially active” depends on geologic evidence, which may not be available for every fault. Although there are probably still some unrecognized active faults, nearly all the movement between the two crustal plates, and therefore the majority of the seismic hazards, are on the well-known active faults. Ground shaking from large earthquakes is responsible for most of the damage caused by earthquakes. Damage to structures is related to the type and quality of construction, and foundation materials. Building codes have been periodically revised to account for our current understanding of how earthquake shaking can damage buildings. Other earthquake hazards, including the surface rupture of a fault, and liquefaction and landslides that can be caused by the shaking, are significant hazards. California state law gives the State Geologist the responsibility of establishing zones where detailed geologic studies must be done before development projects can begin. Every day earthquakes are detected in California by sensitive seismographs that record the minute vibrations of the earth. Each year 100 to 150 earthquakes occur in the state that are big enough to be felt, but few of these cause any damage. Earthquakes large enough to cause moderate damage to structures in the vicinity of the epicenter—those of M5 or larger—occur 3 or 4 times a year. The M6 Whittier Narrows earthquakes, caused by a buried thrust fault, resulted in hundreds of millions of dollars worth of property damage. On the average of once every 2 or 3 years, a moderate earthquake (M6 to 6.9) strikes somewhere in the state. An earthquake of this size, such as the Northridge earthquake of 17 January 1994 (M6.7, buried thrust fault) or the Coalinga earthquake of 2 May 1983 (M6.5, buried thrust fault) is capable of causing major damage if the epicenter is near a densely populated area. Major earthquakes (M7 to 7.9) occur in California about every 10 years on average. 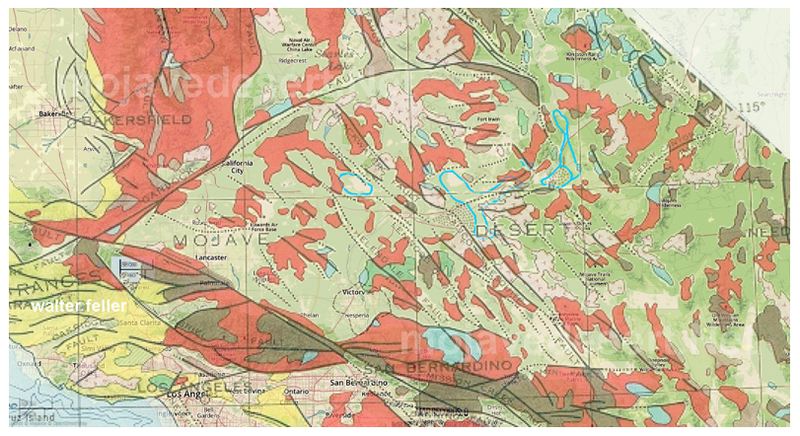 Two recent major earthquakes, the Landers earthquake of June 1992 (M7.3) and the Hector Mine earthquake of October 1999 (M7.1) caused extensive surface fault rupture, but relatively little damage because they occurred in lightly populated areas of the Mojave Desert. Earthquakes of similar size, such as the M6.9 Loma Prieta earthquake of October 17, 1989, cause extensive damage over large areas when they occur in densely populated regions. The two largest earthquakes in California, the Fort Tejon earthquake of 1857 and the famous San Francisco earthquake of 1906 were similar in magnitude (M7.9 and M7.8) and resulted from movement along the San Andreas Fault. Earthquakes of this size (M7.7- 7.9) can cause more extensive damage over a larger area than the M7.1 - 7.4 earthquakes that have stricken California in recent decades. Great earthquakes (M greater than 8) have not occurred in California in historic time, but one earthquake in January 1700 may have been this large. Based on Native American oral histories, tree-ring studies, geological studies that show the uplift or subsidence of large areas of coastal land, and records of a tsunami that struck Japan and cannot be correlated with an earthquake anywhere else around the Pacific, a great (M9) earthquake occurred January 26, 1700 on the Cascadia subduction zone extending north from Cape Mendocino to British Columbia. An earthquake of this size is similar to the one that struck Alaska in 1964 and is capable of extensive damage over a very broad region. The Garlock Fault is the defining fault between the Mojave Desert and Sierra Nevada, Basin and Range geomorphic provinces. ..
A fault is a fracture in the crust of the earth along which rocks on one side have moved relative to those on the other side. Most faults are the result of repeated displacements over a long period of time. A fault trace is the line on the earth's surface defining the fault. An active fault is one that has ruptured in the last 11,000 years. What is "surface rupture" in an earthquake?